event’s inaugural run (obviously, with his financial nous, he had expected that an event which mainly consisted of him giving away money would turn out to generate an immediate profit). The ECB have been variously reported as “in shock“, “in denial” and “unaware” – quite a combination. Adding to the speculation is the news that the ‘Stanford Legends’ have been disbanded. really seem all that comfortable over in Antigua, or indeed to be entirely sure exactly why it was that they were there. The main effect of a Stanford pull-out on the team itself would probably be to reinforce the interest of English players in the cash on offer in the IPL, but that was always going to happen anyway. Matt Prior certainly doesn’t seem too upset. Quite what the effect would be on the ECB’s finances is unclear, though I’d be surprised if they’d budgeted for any future income from a winner takes all match, given England’s shocking record in Twenty20 internationals. New Zealand and the West Indies go into their two-Test series both looking for a boost, but with radically different recent histories. For the Black Caps, a struggle to overcome Bangladesh was followed by failure against a vulnerable Australia, and the selectors’ dissatisfaction with the latter is evident from the changes that have been made to the Test side for this series. Out have gone Aaron Redmond, Chris Martin, Grant Elliott, Tim Southee, Peter Fulton; in have come Jacob Oram, James Franklin, Mark Gillespie, Tim McIntosh and Jeetan Patel. The West Indies, or at least some of them, come in to the series radically richer than they were a few weeks ago following the Stanford Super Series. What effect this will have on the team dynamic, and on the relative importance afforded to Test cricket as opposed to Twenty20, remains to be seen. The fact that the home side have recently slipped behind the tourists in the ICC Test rankings has not been lost on either side, and this factor promises to increase the pressure on both sides. Recent history between these sides suggests that New Zealand are favourites, but the Windies will fancy their chances, and this should be a close (and, I hope, entertaining) series. England are currently being demolished by India in the One Day series between the two sides. Admittedly, the hosts (and Yuvraj in particular) have been exceptional, but England have been awful. What’s the problem? Is it the openers? To some extent. Prior and Bell are not the sort of ODI opening partnership that strikes fear into the hearts of opposition bowlers, and are generally representative of England’s lack of combativeness early in their innings. Prior in particular is now facing accusations that he’s only in the side because he gets on well with Peter Moores, and whilst those are probably unfounded, England’s batting order is certainly a bit odd (Bopara as a specialist batsman at number eight is almost unbelievable). Is it the deployment of bowlers? 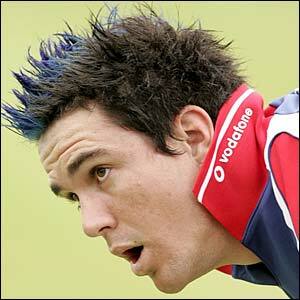 The way in which Anderson has been used, and the continued absence of Graeme Swann, are questionable to say the least. I understand the desire for continuity, but if mistakes have been made, they need to be admitted and rectified rather than swept under the carpet. Is it Allen Stanford? The ghosts of the Super Series may still be haunting a large section of the England dressing room, and the distraction of the IPL-ECB negotiations can’t be helping. Confidence is hardly running high. Chances are that all of these factors are playing a part in England’s slump, but things could still change if the tourists win the next ODI and regain the feel-good factor which characterised Kevin Pietersen‘s first few weeks as captain. 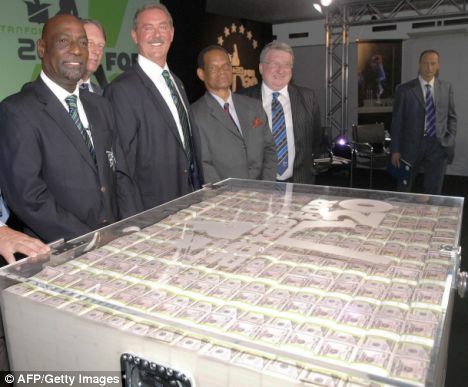 Allen Stanford’s one-man mission to help cricketers dodge the credit crunch reaches its climax tonight as England take on the Stanford Superstars for $20m. The game takes place amid concerns about million-dollar catches, the quality of the pitch, whether the players are comfortable or not, and even whether their wives are in danger of molestation – and all of those links are just from one newspaper. Jimmy Anderson will quite possibly be getting angry phone calls from his bank manager and cancelling his order for a helicopter this morning after it was announced that he’s not in the $20m team. If you want to follow the game, then you can do so here.